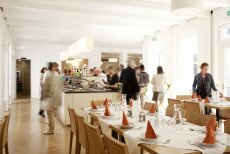 Kardinal König Haus is a professional conference venue in Vienna with a wealth of experience and expertise, excellent customer service and a welcoming and relaxed atmosphere. With its rich history that can still be seen in stone floors or feature windows, it is a perfect blend of character and modern functionality. It therefore provides an ideal location for seminars, congresses, training courses or festivities and caters to a variety of needs. The thirteen multifunctional seminar and conference rooms (seating 10 to 200 people) provide up-to-date infrastructure and are equipped with the latest AV technology to offer you great flexibility. All rooms are easy to reach and fully accessible for wheelchair users or people with limited mobility. Our largest hall is also adapted for hearing impaired guests. All rooms benefit from natural daylight, most from views of the park. Our dining room seats up to 130 guests and is a perfect venue for diverse celebrations. Dining options include traditional Austrian, international and vegetarian/vegan dishes, which are offered buffet style. Because all food is cooked on-site we can cater for a huge range of special requests, be it dietary and allergy requirements or birthday cakes and specially themed menus. We are happy to hear your special requirements and create a bespoke menu that works for you, your guests and your budget. 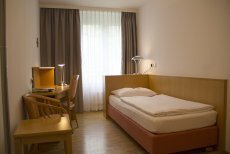 Our spacious bedrooms (mostly single) are en suite and come equipped with telephone and complimentary Wi-Fi. Most of our bedrooms face the park, all are quiet. Five bedrooms are equipped for people with special needs. Each floor can be reached by lift. Whether you need help planning your event, have a question about our venues or want to make a booking, our friendly team is here to help.